Plants with funnel-shaped flowers make interesting garden specimens. Consider your climate and soil conditions before adding new plants to your landscape. Choose plants well-suited to the environment for the best chance of success. Funnel-shaped flowers, or “funnelform,” describes flowers with a wide top and narrow base. Calla lilies (Zantedeschia aethiopica) are native to southern Africa and grow best in U.S. Hardiness zones 8 through 11, depending on the cultivar. 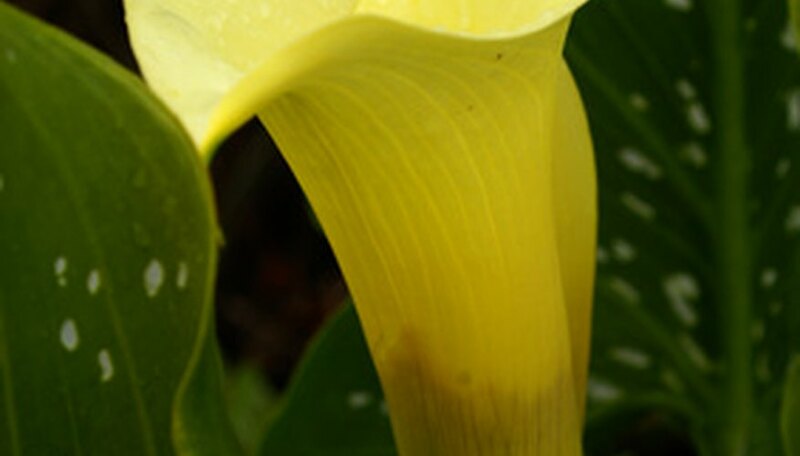 Calla lilies have large, often white, but other hybrid colors exist, funnel-shaped flowers. The flowers are elongated and taper at the top, with a spike-like spadix protruding or enclosed within. Cultivated calla lily species tolerate moderate frosts, but may lose their large leaves. Some cultivars prefer damp conditions, but most grow in full or partial sun in various, moisture-retentive garden soils. Calla lilies are beautiful fresh cut flowers in arrangements. Freesia flowers are funnel-shaped and branch asymmetrically from a curved spike of the main plant stem. Freesia are available in a wide variety of colors and have a lovely fragrance. Grow freesia in full afternoon sun on well-drained soil and flower during the summer months. Freesia is injured below temperatures of 25 degrees F. Cut freesias are good for flower arrangements. Grow daylily (Hemerocallis hybrids and cultivars) as a dense ground cover, as they look best grown in large masses or grown as border plants. Daylily funnel-shaped flowers range in various combinations of yellow, orange, red and purple. Some types are single or double and vary in size—dwarf, medium or tall. Grow daylilies in full sun or partial shade on a wide range of soils. Dig and divide daylily plants every five to seven years for the best flowering. Deadhead (remove) spent daylily flowers after blooming to maintain garden appearance. Yellow elder (Tecoma stans) is native to tropical America and is an evergreen, shrubby-vine with a weedy tendency. Its funnel-shaped flowers are 2 inches long in clusters. Yellow elder rapidly grows to 20 feet tall, with a 15 foot spread. Grow yellow elder in full sun on any well-drained soil. Yellow elder does not tolerate waterlogged conditions and is not frost tolerant.